I have to confess. I had cupcakes and kettle corn for dinner. I originally wanted to make caramel corn, but a quick google revealed that all caramel corn recipes require corn syurp (which I don’t have) and over an hour in preparation and baking (which I don’t want to give!). Kettle corn, on the other hand, only requires popcorn, sugar, salt, and oil. And it’s done when the corn is done popping. Heat oil in a large pan with a lid. Add corn, and when you see the kernels are about to pop, add sugar and shake pan. Remove from heat when you’re only hearing a pop every five seconds ago – I’m serious about this! 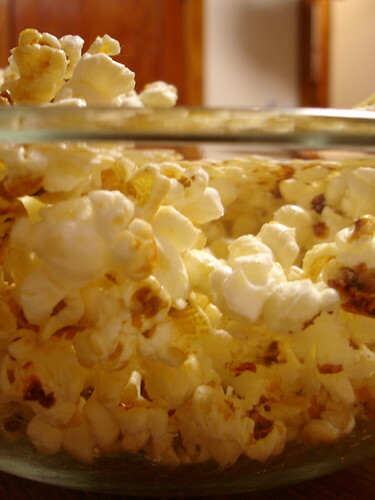 The sugar makes it even easier to scorch than plain popcorn, so take it off the heat already! Sprinkle on some salt (about 1/2 tsp) and serve. I made them to bribe my landlord to put up my new pot rack. Mission accomplished! Well played. I didn’t replace any meal with kettle corn but I did happen to eat massive amounts of it from the farmer’s market this afternoon. What a nutritious dinner you had. I’ve only recently found your blog, and I LOVE it! I love all your recipes and your beautiful photos. Right on! Mamafabun – This was actually the first time I had kettle corn! I always see caramel corn for sale instead. I wonder if it’s a regional thing? Springsandwells – Thanks for your kind words. I just realized that you have a vegan food blog too! Awesome! I don’t know whether it’s regional. My friend and dorm-mate introduced it to me in college and I was hooked! I mean I have READ many of YOUR other food posts. After looking back on what I said, I realized that it didn’t read like I wanted it to.